The iconic British footwear firm previously on the verge of bankruptcy a decade ago is now forecasting pre-tax profits of £30 million this year, a 40% increase on the 2012 pre-tax profit of £17.9 million as it continues to diversify its product base and build on its enduring popularity among youth subcultures and loyal consumer base. Managing Director David Suddens said the turnaround in the company’s fortunes and profits were the result of moving the bulk of its production to China and expanding into foreign markets. 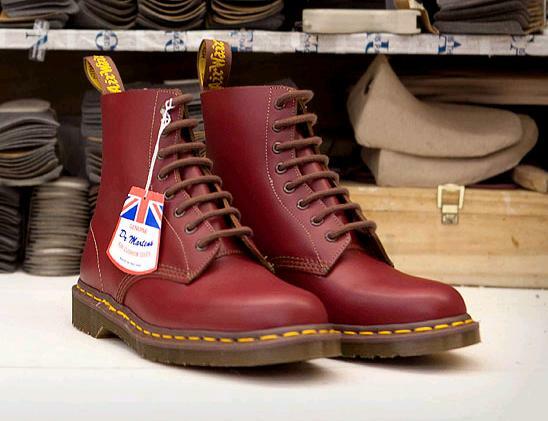 Dr Martens products have been made by the R Griggs Group in Wollaston, Northamptonshire, since 1960. In 2004, Dr. Martens began producing footwear again at the Cobbs Lane Factory in Wollaston, England. These products are part of the “Vintage” line which the company advertises as being made to the original specifications. New designs have now also been introduced and more people, including apprentices, are being employed in Northamptonshire. Today DM boots, shoes and accessories are sold in over 63 countries worldwide. Since 2009 the R. Griggs company has also opened over 15 new Dr. Martens retail stores in the United Kingdom, United States and Hong Kong and also launched a line of clothing. Dr. Martens remains in the ownership of the Griggs family headed by Max Griggs.